Wood never ceases to amaze us for its beauty and utility, even after 50 years in the woodworking business. There are hundreds of woods to choose from; innumerable ways to use it. Without doubt, wood is a phenomenal material. The following is a basic primer on how we choose the wood we use in our fine designs. At Midland Cabinet Company, we don’t take wood for granted. We celebrate it. No matter where we get our wood, most of the trees we work with are hard, as opposed to soft, wood species, hard being the preferred grade for cabinetry, millwork, furniture and floors. Hardwood, as its name implies, is dense and more durable; it doesn’t mar or dent easily, the attributes required for fine interior woodworking. Of the domestic hardwood trees, oak is always a favorite, both red oak and white, which is slightly harder and considered a high-end material. Alder is popular, too, and it’s one of our favorites. Although not the hardest of the hardwoods, alder is a stain-grade wood, meaning it accepts a stain well and absorbs it evenly. Other domestic hardwoods that make their way into our home designs: ash, American maple, cherry, beech, red birch and white birch, and hickory. 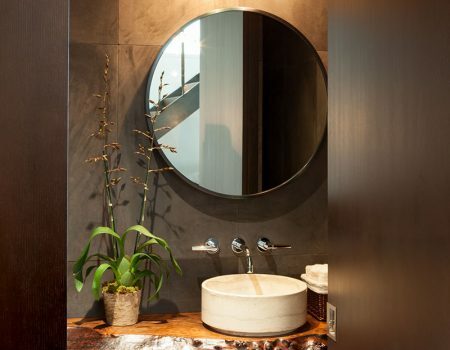 As beautiful as domestic wood is, exotic woods can take your breath away. More expensive than domestic wood, if the budget accepts the price tag there is nothing quite as awe-inspiring as a cabinet made of bubinga, or African redwood, a reddish-brown wood with an intricate, tight grain. 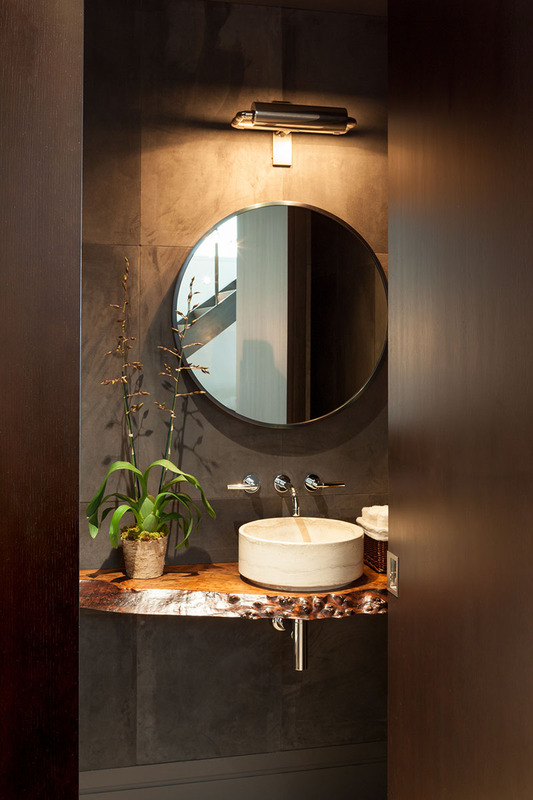 Or wall paneling crafted from zebrawood, a lightly colored African wood with a riot of black striping. Not to mention cabinets and furniture crafted from one of the finest hardwoods in the world, Madagascar Ebony. Domestic trees are grown in U.S.-based plantations that manage the demand for the vast amount of wood the world requires. Another reason why we like alder: it’s a fast-growing tree, which means it is not in danger of being depleted. Exotic woods may not be as carefully managed as domestic wood, though today consumers have a way to ensure that the wood they choose from Midland is sustainably grown: certification by the Forest Stewardship Council. Reclaimed wood is another sustainable option. 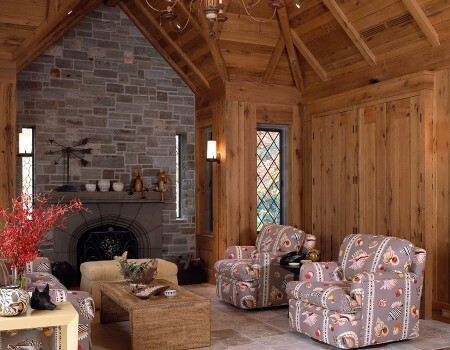 It’s not a newcomer to interior design: designers and architects have utilized recycled wood from old barns and bridges, even logs buried in water, for years to add drama and character to modern homes. We’ve done quite a few jobs using reclaimed wood, among them a kitchen of rough-sawn white oak timbers salvaged from a farm in Indiana. Ceiling, cabinets and paneling — basically the entire kitchen — were fashioned from the farm’s vintage barn, giving the room a warm, rustic and inviting atmosphere. 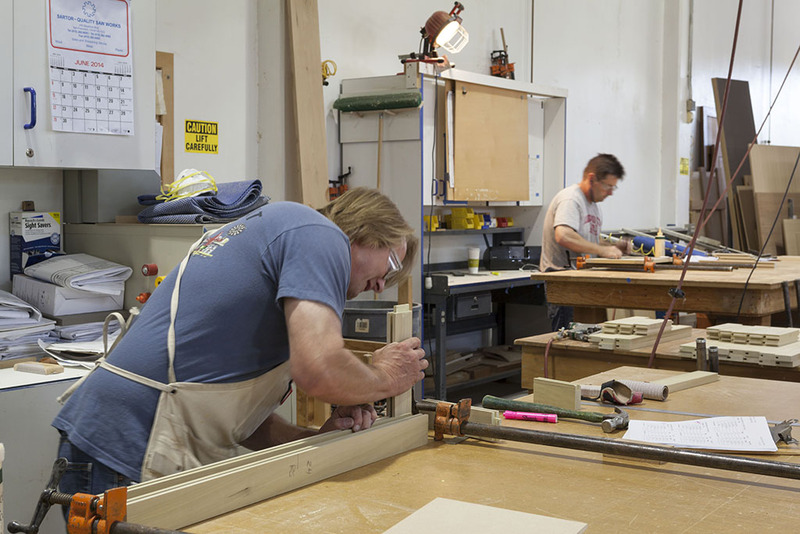 There are three categories of wood used in our onsite millworks facility, where we handcraft all our designs and products: solid wood, plywood and particleboard. Each has its purpose and attributes. Solid wood — from the hardwood discussed above — is chosen for its appearance, or grain, as well as its quality, when used for interior work. The solid wood we use is also “dry,” as opposed to wet. Dry wood keeps its shape. It won’t expand or contract during the woodworking process. Dry wood is dried after it is cut into boards at the sawmill, using either air- or kiln-dried methods. Some high-end cabinets are constructed from extremely dry wood. Wood that is only partially dried at the sawmill is called wet, and is used primarily in home construction. It also costs less. Of the categories of wood in woodworking, particleboard is the greenest. In fact, it’s a Zero Waste product. Particleboard is created by basically pureeing wood into a slurry, which, with the addition of a bonding agent and high pressure, is pressed into a solid flat slab. Nothing is wasted in the process. Particleboard has no grain, which makes it a natural surface for paint. It’s strong; it doesn’t expand or contract — any water in the wood was pressed out — and it’s inexpensive. For all its attributes, particleboard is far from decorative, though it can find its way into high-style designs. A type of particleboard called MDF (for medium-density fibreboard) is often used as the substrate upon which architectural-grade veneers are glued. Plywood is made by gluing together thin layers of wood with their grains at right, or perpendicular, angles to each other, which gives plywood its primary attribute, strength. Those layers are called veneers. Not only is plywood strong, it doesn’t crack, shrink or warp — and it looks better than particleboard because plywood retains what gives wood its individual character, its grain. Veneers, of course, vary in style and appearance quality. For the majority of our work, we use the very best veneers — these are architectural veneers, also known as fancy-face, constructed from paper-thin sheets of quality domestic and exotic woods. There are various ways in which these sheets of veneer are cut and constructed into job-worthy panels, but with fancy-face, in particular, the goal is always to maintain and accentuate the beauty of the wood grain. Fancy-face veneers are a Midland specialty, with each veneer handpicked for evenness of color and grain. 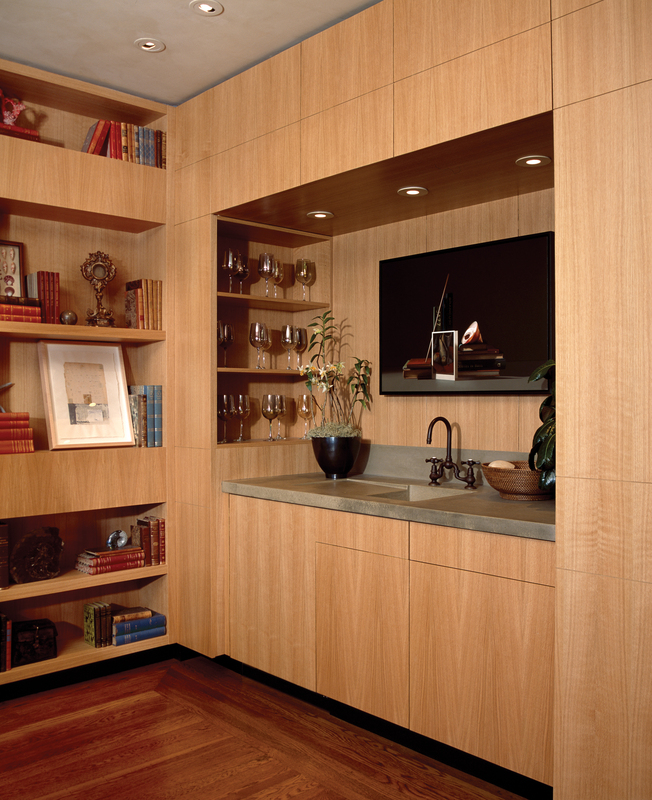 All Midland Cabinet veneers are formaldehyde-free. The way the thin sheets of veneers are spliced together to create a veneer’s distinguishing appearance is called matching. At Midland, we use three primary matching styles: book matching, slip matching and center balanced. In book matching, alternating pieces of veneer are “flipped over” so that they face each other, like a butterfly, or, as its name implies, like facing pages in a book. In slip matching, the veneer slices are placed in sequence, not flipped. Center balanced is the most aesthetically pleasing and the most intensive for the woodworker. Here, we assemble uniform sheets of veneers around a joint, or vertical splice line, in the middle of the panel to create a symmetrical grain pattern. 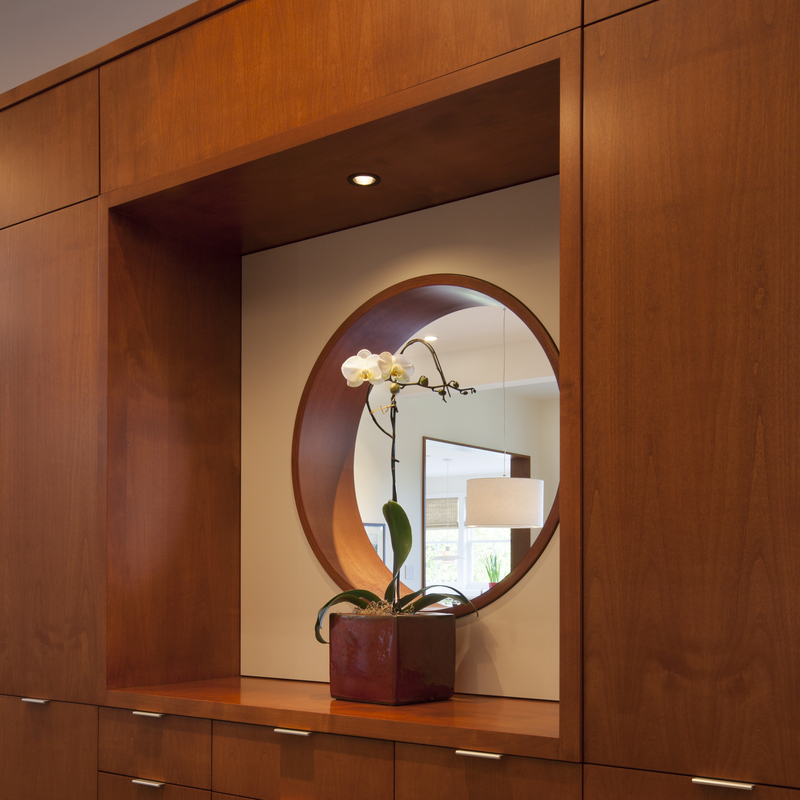 Center-balanced matching is a dramatic way to display the grain, and its symmetry can enhance the overall design of the room. 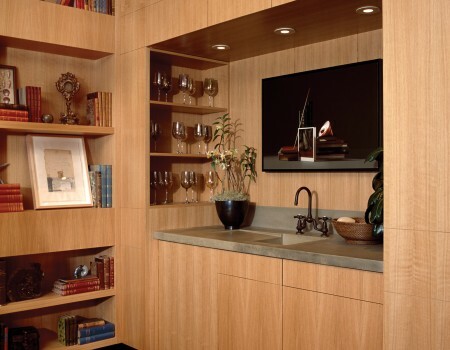 In some high-end jobs, clients want a consistent look in the veneer paneling throughout the room — on all the cabinets and the wall paneling, for example. To ensure this uniformity, we rely on blueprinting, which, as its name implies, is a detailed, to-scale drawing of the veneers to be used on a project. 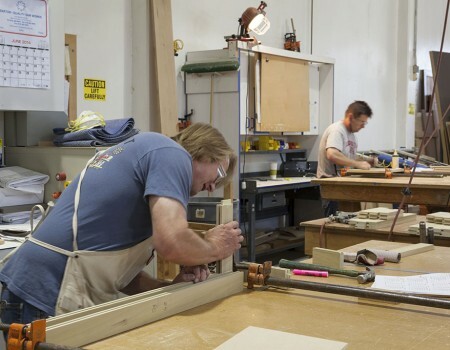 Blueprinting is an exacting woodworking science, and successful only in the hands of experts, like Midland. It takes skill and expertise to render a blueprint; years of experience to ensure the perfect harmony of grain and balance. And it takes what Midland has plenty of: respect for what makes it all possible — wood.